The west side of El Malpais National Monument is less accessible than the east as the land becomes wooded and mountainous, rising to several peaks over 8,000 feet, along the continental divide, yet here are found some of the best volcanic features, including a chain of over 25 cinder cones (mostly within the adjacent El Malpais National Conservation Area), and remnants of a lava cave system 17 miles long, originating from Bandera Crater. 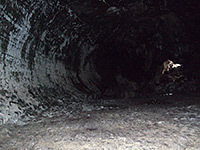 Part of this is known as the Big Tubes, reached by a seven mile drive on unpaved forest tracks followed by a short hike across the lava flow; the trail leads to two caves (Big Skylight and Four Windows), both quite extensive and containing permanent ice formations, plus a series of lava bridges over a collapsed portion of the cave. The Big Tubes area is remote, undeveloped and very little visited but there is enough to see for at least half a day, if all the passageways are explored fully. The longest cave is about a quarter of a mile, and the NPS recommends that anyone exploring underground needs a hard hat, gloves and three light sources, though as caves go, these are relatively easy to follow. Map of El Malpais National Monument. 27 views of the Big Tubes; gallery, slideshow. The unpaved road to the Big Tubes is covered by snow in winter and is generally not passable in spring until all has melted and the ground has dried; the surface is soft soil that becomes deeply rutted if driven over when wet. If dry, the route is usually fine for all vehicles though high clearance may still be required. The road forks south from NM 53 just west of the Bandera Ice Cave and is signposted as the Chain of Craters Backcountry Byway (county road 42); this crosses sparsely forested land, alongside the lava flow for a while then back into the woods. A junction with the Big Tubes Road is reached after 4.5 miles - a narrower but less traveled track, so also less rutted, which passes more ponderosa pine/Douglas fir woodland on the lower slopes of the Cerro Rendija crater for 2.8 miles to the small parking area at the trailhead. This has rest rooms, an information board and trail map, and would be a good, peaceful place to camp, as so few people visit. 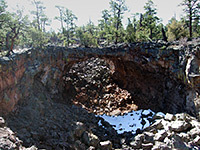 The track continues south and becomes much rougher as it crosses part of the lava, leading to Hole-in-the-Wall (an elevated, wooded plateau surrounded by lava), in the West Malpais Wilderness. The parking area is right at the edge of the lava field, here quite irregular and not much overgrown - scattered aspen, pinyon pine, juniper, bushes and echinocereus cacti grow on the rocks but most of the surface is uncovered and quite black in color, or reddish lower down in crevices. The path to the tubes heads due east, marked by cairns of lava blocks at closely spaced intervals every 30 feet or so, hence the route is quite easy to follow. A sign after 0.3 miles marks a junction from where three routes branch off to the south (Seven Bridges), east (Four Windows Cave) and north (Big Skylight Cave) - all just a few minutes walk away. 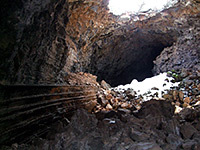 Seven Bridges is a deep, mostly collapsed lava tube with a number of short sections of roof that have remained intact. Some of the bridges are many feet thick, have full size ponderosa pine trees growing on top, and are up to 50 feet above the floor of the tube, which is covered by huge broken boulders and bordered by sheer walls, though with various places where it is possible to climb down and walk under the bridges. The south end of the tube descends into a short cave which retains snow and icicles well into summer. Named because of the small openings in the roof near the main entrance, Four Windows Cave extends a short distance south but a long way north, and some parts have smooth walls and floor, not partially buried under fallen boulders as is often the case. Near the entrance is a small moss garden, sustained by short-lived shafts of sunlight, roped off to protect the delicate plants and insects who live there. The cave deepens northwards, down a slope of lava blocks to the original floor level, where flow patterns from the lava can still be seen. Several narrower side passages join, also smooth-walled. 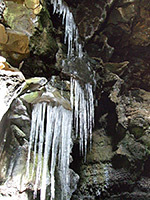 Icicles are often present near the entrance, and deep into the cave is a beautiful (seasonal) stalagmite garden, containing dozens of rounded ice formations covering the cave floor from wall to wall. 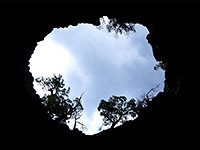 The largest and deepest cavern is entered just north of the trail junction - Big Skylight Cave extends southwards from the opening, starting with a section filled with broken lava blocks underneath a circular roof opening - the Skylight - and bordered by vertical walls crossed by well-defined ledges, remnants of differing levels of the lava flow. 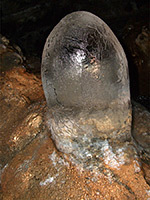 Further along, the cave becomes very tall, with a domed ceiling high above the floor which remains carpeted by boulders. 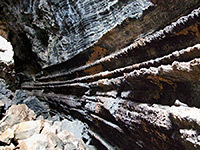 The main passage forks near the end and both branches continue to deepen, while other smaller tubes join from both sides, at different levels; a little climbing is necessary to get in. Some parts have ice formations but these are not as extensive as in Four Windows Cave. Back above ground, the northwards section of the lava tube has completely caved in, forming a long, curving ravine (Caterpillar Collapse), viewable from another branch of the trail.